I've stumbled across pictures/reviews of these beautiful plants/pods. I would definitely love to grow these this year if possible. Does anyone have any extras they can spare? I have some extras on my profile that I would gladly send it return. Thanks in advance! That's a tall order to fill. Very short supply when they are available and the line in front of you is around the corner. You might fare better getting some bhuts, pimenta de neydes and crossing your own. probably with a good dose of dedication, you'll have stable crosses b4 you will find them available. Edited by CAPCOM, 15 February 2015 - 10:35 PM. Wow I didn't realize they were that rare. I don't mind attempting the cross myself if I can get my hands on some Pimenta de Neyde. They are around from time to time, everyone I know who has gotten seed for them has done so by ordering over the pond. I think there is a grower in Italy with them. I started to do what I suggested to you last year but will have to resume this year. I would send you PDN as I had a bunch put away but I didn't mark the package so I cannot confirm that what they are. Now I have to grow extra seed just to ID packages, yeah, more than one. I've got my Pimenta De Neydes in the propergator atm .. Whoop Whoop ! So is this where you guys got your Pink Tigers? If so, did they grow true? I'm willing to buy but I've never gone through this site before. He's is the creator of pink tiger on the site I linked and prolly the best source. I haven't grown it but to my knowledge, it's not stable yet, some grow true some don't. oh damn didn't see hogleg already posted the link. I have black pearls and PDNs. 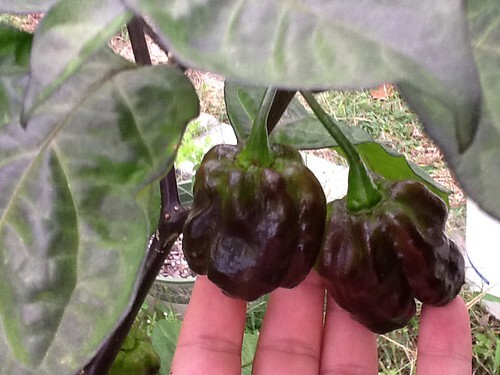 I also have f3 seeds of different versions of a 7 pot Jonah crossed with a pimenta de Neyde that I did. 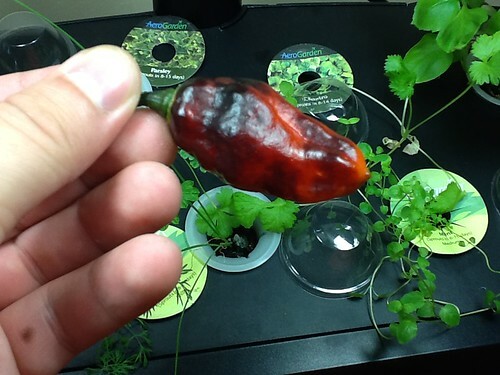 I have red, orange, yellow, and two different purple and red versions of the F1 crossed with a Trinidad Scorpion Moruga. This particular one is a creamy white and extremely purple. Perhaps you will get one with stripes. I don't have many seeds, but I could spare some. Edited by Dulac, 16 February 2015 - 11:24 PM. Whoa! very interested in the orange f3's. sending PM. Dulac I'm growing f3s of the yellow 7jpdn this year! Would love to grow the scorpion mix for ya lmk! I can send you some. Just pm. I'm with hogleg. Those orange F3's look mean! :-) Sending PM now. Sorry guys, I have to correct you. He's NOT the creator of Pink Tiger. I have contact him last year on facebook and he told me this. 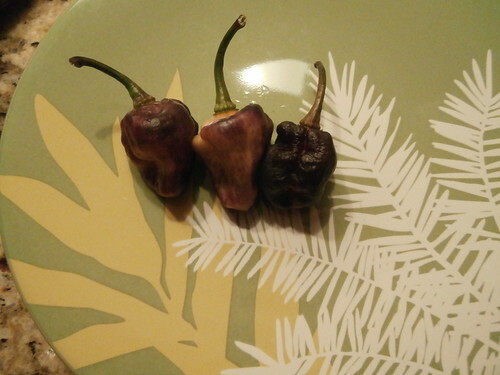 Besides, here you can read with your eyes: http://mojopepper.bl...ili-pepper.htmlHe say "It comes from a variety selected by an italian association and circulated with different names"
Never bought from him, got some seeds from Tom (Kentishman) - thanks again, Tom! Hey, do you guys mean the 7JPN "Burnt." That one is more so on the red side. It's unique for the 7JPN so far because it keeps a lot of the purple. Edited by Dulac, 17 February 2015 - 02:52 PM. Yea I assumed the picture of the "burnt" one was the orange. It sounds like I was wrong.